A new generation of insect larvae is eating the roots of genetically engineered corn intended to be resistant to such pests. The failure of Monsanto’s genetically modified Bt corn could be the most serious threat ever to a genetically modified crop in the U.S. But even though a scientific advisory panel warned the Environmental Protection Agency (EPA) that the threat of insects developing resistance was high, Monsanto argued that the steps necessary to prevent such an occurrence — which would have entailed less of the corn being planted — were an unnecessary precaution, and the EPA naively agreed. The EPA’s experts also are suggesting that the agency reconsider its approval of a new kind of rootworm-killing corn, which Monsanto calls SmartStax. This new version of Bt corn includes two different Bt genes that are supposed to kill the rootworm in different ways. This should help prevent resistance from emerging, and the EPA is allowing farmers to plant it on up to 95 percent of their corn acres. But if one of those genes is already compromised… such a high percentage of Bt corn could rapidly produce insects that are resistant to the second one, too." There can be little doubt that genetically engineered crops are the most dangerous aspect of modern agriculture. Not only are we seeing rapid emergence of super-weeds resistant to glyphosate, courtesy of Roundup Ready crops, we now also have evidence of emerging Bt-resistant insects. Add to that the emergence of a brand new organism capable of producing disease and infertility in both plants and animals, and a wide variety of evidence showing harm to human health, and the only reasonable expectation one can glean is that humanity as a whole is being seriously threatened by this foolhardy technology. Monsanto’s genetically modified "Bt corn" has been equipped with a gene from soil bacteria called Bt (Bacillus thuringiensis), which produces the Bt-toxin. It’s a pesticide that breaks open the stomach of certain insects and kills them. This pesticide-producing corn entered the food supply in the late 1990’s, and over the past decade, the horror stories have started piling up. And the problem with Bt crops go far beyond the creation of Bt-resistant insects. Monsanto and the EPA swore that the genetically engineered corn would only harm insects. The Bt-toxin produced inside the plant would be completely destroyed in the human digestive system and would not have any impact at all on consumers, they claimed. Alas, they’ve been proven wrong on that account as well, because not only is Bt corn producing resistant "super-pests," researchers have also found that the Bt-toxin can indeed wreak havoc on human health. Bt-Toxin Now Found in Many People’s Blood! The study authors speculate that the Bt-toxin was likely consumed in the normal diet of the Canadian middle class—which makes sense when you consider that genetically engineered corn is present in the vast majority of all processed foods and drinks in the form of high fructose corn syrup. They also suggest that the toxin may have come from eating meat from animals fed Bt corn, which most livestock raised in confined animal feeding operations (CAFO, or so-called "factory farms") are. These shocking results raise the frightening possibility that eating Bt corn might actually turn your intestinal flora into a sort of "living pesticide factory"… essentially manufacturing Bt-toxin from within your digestive system on a continuing basis. If this hypothesis is correct, is it then also possible that the Bt-toxin might damage the integrity of your digestive tract in the same way it damages insects? Remember, the toxin actually ruptures the stomach of insects, causing them to die. The biotech industry has insisted that the Bt-toxin doesn’t bind or interact with the intestinal walls of mammals (which would include humans). But again, there are peer-reviewed published research showing that Bt-toxin does bind with mouse small intestines and with intestinal tissue from rhesus monkeys. Rats fed another of Monsanto’s Bt corn varieties called MON 863, also experienced an activation of their immune systems, showing higher numbers of basophils, lymphocytes, and white blood cells. These can indicate possible allergies, infections, toxins, and various disease states including cancer. There were also signs of liver and kidney toxicity. Farmers have used Bt-toxin from soil bacteria as a natural pesticide for years, and biotech companies have therefore claimed that Bt-toxin has a "history of safe use in agriculture." But there’s a huge difference between spraying it on plants, where it biodegrades in sunlight and can be carefully washed off, and genetically altering the plant to produce it internally. Bt crops have the Bt-toxin gene built-in, so the toxin cannot be washed off. You simply cannot avoid consuming it. Furthermore, the plant-produced version of the poison is thousands of times more concentrated than the spray. When natural Bt-toxin was fed to mice, they had tissue damage, immune responses as powerful as cholera toxin, and even started reacting to other foods that were formerly harmless. Farm workers exposed to Bt also showed immune responses. The EPA’s Bt Plant-Pesticides Risk and Benefits Assessment, created by their expert Scientific Advisory Panel, states that "Bt proteins could act as antigenic and allergenic sources." Did you know that two years ago, the American Academy of Environmental Medicine (AAEM) called on all physicians to prescribe diets without genetically modified (GM) foods to all patients? I couldn’t agree more. Avoiding genetically engineered foods should be at the top of everyone’s list—at least if you want a decent shot at optimal health. The simplest way to avoid genetically engineered (GE) foods is to buy whole, certified organic foods. By definition, foods that are certified organic must never intentionally use GE ingredients, and must be produced without artificial pesticides or fertilizers. Animals must also be reared without the routine use of antibiotics, growth promoters or other drugs. Additionally, grass-fed beef will not have been fed GE corn feed. This means you should avoid products with corn, soy, canola, and any of their derivatives listed as an ingredient, unless it’s labeled USDA 100% Organic. As of late last year, this also includes sweet corn, as Monsanto introduced a brand new genetically engineered sweet corn called Seminis®, which contains not just one but TWO types of Bt-toxin, PLUS the Roundup Ready gene for weed control! So besides containing the insecticide, their toxic Roundup herbicide will also accumulate in the kernels. For a helpful, straightforward guide to shopping Non-GMO, see the Non-GMO Shopping Guide, created by the Institute for Responsible Technology. Mandatory labeling may be the only way to stop the proliferation of GM foods in the U.S. Monsanto and other biotech companies spend huge amounts of money lobbying the US government each year to ensure favorable legislation. In the first quarter of 2011 alone, Monsanto spent $1.4 million on lobbying the federal government — a drop from a year earlier, when they spent $2.5 million during the same quarter. 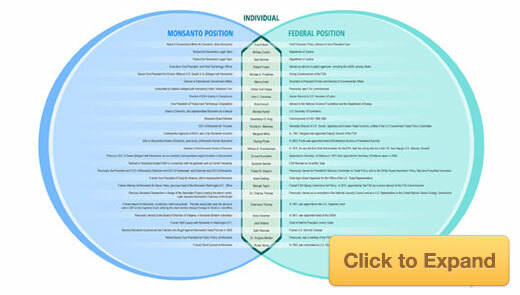 Their efforts of persuasion are also made infinitely easier by the fact that an ever growing list of former Monsanto employees are now in positions of power within the federal government. Many don’t fully appreciate the strategy of seeking to have genetically engineered foods labeled in California. The belief is that large companies would refuse to have dual labeling; one for California and another for the rest of the country. It would be very expensive and a logistical nightmare. So rather than have two labels, they would simply not carry the product, especially if the new label would be the equivalent of a skull and crossbones. This is why we are so committed to this initiative as victory here will likely eliminate genetically engineered foods from the US. "Coca-Cola Co. and PepsiCo Inc. are changing the way they make the caramel coloring used in their sodas as a result of a California law that mandates drinks containing a certain level of carcinogens bear a cancer warning label. The companies said the changes will be expanded nationally to streamline their manufacturing processes. They’ve already been made for drinks sold in California." Public opinion around the biotech industry’s contamination of our food supply and destruction of our environment has reached the tipping point. We’re fighting back. That’s why I was the first to push for GMO labeling. I donated a significant sum to the first ballot initiative in California in 2012, which inspired others to donate to the campaign as well. We technically "lost the vote, but we are winning the war, as these labeling initiatives have raised a considerable amount of public awareness. Recently, Rep. Mike Pompeo (R-Kan) has reintroduced a bill (HR 1599) that would preempt states’ rights to enact GMO labeling laws. This bill would create a federal government program to oversee guidelines for voluntary labeling of products that do not contain GMOs. It would specifically prohibit Congress or individual states from requiring mandatory labeling of GMO foods or ingredients. It would also allow food manufacturers to use the word "natural" on products that contain GMOs. Posted in Science | Tags: Bt corn, larvae, pesticide, roofs.